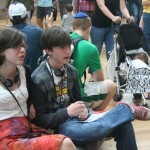 The second full day in Paris we toured the Louvre, each taking an audio tour device and going our separate ways to enjoy the things that interested us the most. 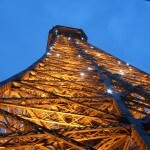 Most everyone’s time was spent exploring the sculptures and paintings of Italian artists over several centuries. 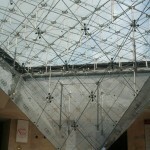 We passed the elusive upside down pyramid en route to enter the Louvre. 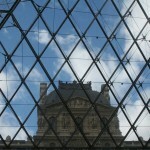 The palace tower seen through the glass pyramid. 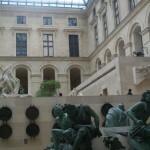 This big room is just inside the Richelieu wing of the Louvre and displays a lot of French sculpure. 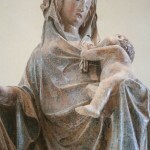 Close up of French impressionist sculpture of Madonna and child. 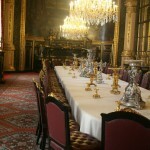 The large dining room of Napoleon, III. 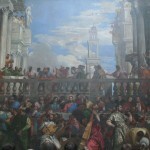 The Wedding Feast at Cana, by Veronese from Venice, Italy. This painting depicts Christ’s first miracle. 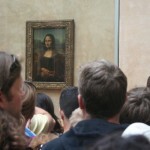 The famed Mona Lisa and the crowds that come to see her. Watching her slight smile in a room of four hundred people threw another light on the question of where that smile came from!